Репортаж The Christian Science Monitor из подмосковных подземелий, подготовленый при участии нашего эксперта - Олега Бондаренко (Клетчатого). Статья приводится "как есть", на английском языке. (SYANOVO, RUSSIA)Welcome to a world that gives a whole new meaning to the phrase "underground culture." A small entrance, on the banks of the Pakhra river 25 miles south of Moscow, might be mistaken for a fox den - or the burrow of a large white Lewis Carroll rabbit. For this is a portal into a Russian Wonderland, where visiting Alices can suddenly find themselves in a mélange of a Soho art gallery, a museum of the absurd, and an ever-nocturnal wilderness retreat. The maze of man-made tunnels carved out of limestone some 200 years ago is now the locale of a subculture both literally and figuratively. It's a happening, an escape, and an alternative to anything mainstream. Spelunkers come here for adventure. Musicians enthuse about the subterranean acoustics. Rave artists say the best New Year's parties are thrown down under. And some folks come just to get away from the hectic pace of life on the surface. "I'm resting from the bad life above," says a man who simply calls himself Sergei, sitting contemplatively in the dark on a rock. He says he has spent every weekend underground for the past 20 years to get away from "chaos." Others come to the cool tunnels to simply escape the summer heat. This network has a long and, sometimes dark, history. It was first tunneled out in the 18th century to extract stones for Moscow buildings. Since then, the man-made caves, known simply as the sistema (or system), have served alternatively as a bunker hospital during World War I, a meeting ground for clandestine political gatherings under the Soviets, and a garbage dump. These days, less-desperate people come here, equipped with flashlights - and a sense of whimsy. The walls of the sistema are decorated with modern relics collected from the world above. These galleries include highway and traffic signs, car license plates, and billboards that hang incongruously on the smooth, cool rock faces. They serve to orient meandering explorers as well as provide amusement. "If you want to check the schedule for the 439 bus to Moscow, you'd most likely find it here," says Oleg Bondarenko, a regular visitor to the sistema. 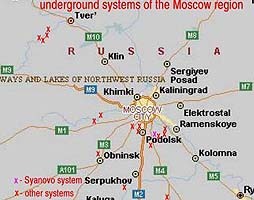 There are other similar tunnels near Moscow, including some constructed by Ivan the Terrible more than 400 years ago to get stone to build the Kremlin. This sistema is particularly favored by the bohemian set. But it's not well known, even to locals. Here on the banks of the Pakhra river, the picnickers and sunbathers on the surface are sometimes surprised to see adult men and women slithering out of, or disappearing into, a muddy hole in the earth. Sign in here, please A blue sign with the Russian word Kassa (cashiers) marks the start of our journey. Here cavers sign their names in a log book with joking comments, nicknames, and warnings. Someone who goes by the nom de plume "Greenpeace Emergency" writes: "I'm sick and tired of oatmeal. I want something else to eat." First-time visitors identify themselves in the log book as chainiks or teapots, the name given to the novice car drivers, too. Further into the tunnel, one walks past signs proclaiming "House for Sale," "No Entrance," "How to Use the Elevator." And there's the periodic painted advisory "Boom" - a warning not to bump your head. The sense of humor extends to the names of the various grottos and galleries with such descriptive sobriquets as "Banana Islands," "Hamster Hall," and "The Coffin." There is a special room designated as the kitchen, which is complete with cupboards. The dining room is equipped with a stone table draped with a white table cloth and cups. "I use my torch instead of candles for a romantic touch," says Bondarenko. The subterranean bedroom has a large rock "bed" that sleeps 12 (fitfully, one presumes), and there is even a designated bathroom, which regulars insist is hygienic. Music that resonates The "Flying Room" derives its name from iron radiators that someone suspended from wires attached to the rock ceiling. It is here that musicians hold jam sessions because, they say, of the unique acoustics. The most notorious room is the "Mausoleum," heralded with signs taken from a cemetery. First-time visitors are met with the macabre sight of a skeleton laid down on a slab of rock. 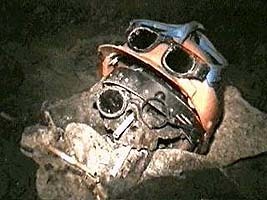 He is dressed in a workman's coveralls and boots, and his skull is covered by a gas mask and World War I metal helmet. "Everyone calls him Aristarkh, but no one knows who he was," says Bondarenko. There are many legends, the most common of which is that he was a soldier who deserted his platoon and lost his way while hiding in the cave. Nowadays the sistema is a much more sociable place. Two juvenile groups, who aren't known for their interpersonal relations on the streets above, visit the caves regularly and coexist peacefully here. Bohemians hold annual meetings - including humor contests, singing fests, and recitals of poetry. Local teenagers come to the place to do what teenagers do. Some people camp down here for an entire weekend. Among them was a group of five who bounded out of the darkness with miners' lamps on their foreheads and camping gear on their backs. "This is the max, it is an incomparable activity," enthuses Roman Artyomov. The unofficial record for the remaining underground is held by a man who claimed to last for more than a month. But it was later reported that he had made periodic forages above ground in search of beverages. Our foursome had enough of the dankness and stooping in the darkness after three hours. Literally spotting a light at the end of the tunnel, we "threw ourselves out" as cavers describe the exiting procedure. We crawled on our stomachs for the final 15 feet and emerged blinking at the blinding light of day. "It's like being reborn," said one member of our group overwhelmed by the colors, the sound of birds, and smell of grass. 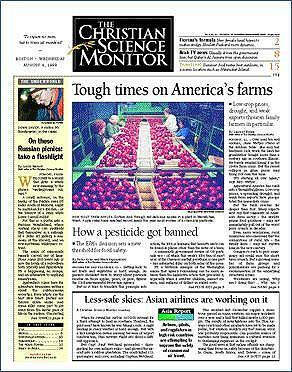 (c) Copyright 2002 The Christian Science Monitor. All rights reserved.